With elections for the city’s mayor and council coming up in May, and with growth sure to be a topic of debate and contention, voters may want to ponder Denver’s journey to the present before making decisions about its future. 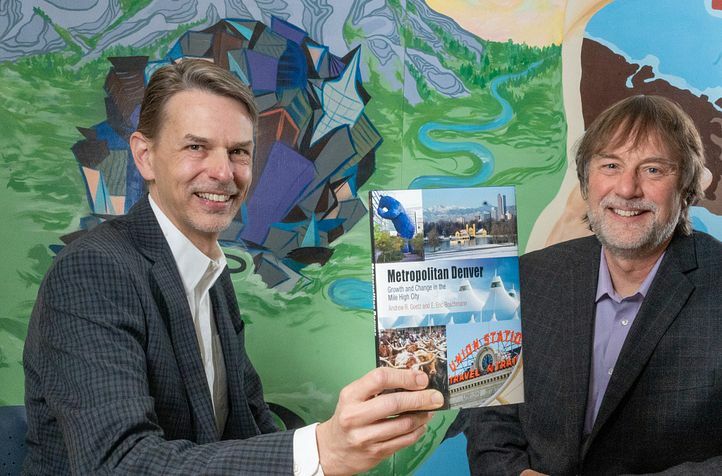 To get up to speed, they can start with “Metropolitan Denver: Growth and Change in the Mile High City” (University of Pennsylvania Press, 2018) by professors Andrew Goetz and Eric Boschmann of the University of Denver’s Department of Geography and the Environment. A recent installment in the publisher’s Metropolitan Portraits series, the book joins a shelf of volumes on urban areas with distinctive stories, among them Northern New Jersey, Phoenix, Toronto, Detroit and Miami. Each portrait approaches its subject differently, with some focusing on the forces driving transformation and others looking at the challenges associated with, say, living in the shadow of a bigger berg. The Denver story, served up with what the authors call “a geographic perspective,” ranges over 161 years of boom-and-bust development — from Denver’s emergence as a remote outpost to its heyday as an oil-and-gas commercial center to its current status as a “Next Frontier” city, a designation made in 2010 by the Brookings Institution’s “State of Metropolitan America” report. As a Next Frontier city, Goetz explains, Denver joins Seattle, Austin and other metroplexes whose levels of population growth, diversity and education outpace the national average. Although they are positioned for prosperous futures, Next Frontier cities face their own set of perplexing problems. Denver’s are by no means unique — congestion, deteriorating air quality, housing affordability and the resulting displacement of marginalized populations — but they do require thoughtful solutions. Goetz and Boschmann are just the duo to situate these issues in detailed context. The former is Denver’s go-to authority on transportation infrastructure, urban economic growth and smart growth planning, while Boschmann researches job accessibility for the working poor, urban sustainability and Denver as an urban place. He came to Denver from the Midwest and was immediately struck by how the city has been shaped by its landscape and by a population that, for the most part, came here from other places. “One of the themes that we talk about is that Denver is a city of transplants. I’m a transplant, Andy’s a transplant. Many of us are from somewhere else,” Boschmann says. In other words, Denver’s spot on the map didn’t materialize by accident. In 1867, to ensure that Denver could capitalize on construction of the transcontinental railroad through Wyoming, city leaders raised funds to build a spur rail line to Cheyenne. This made it possible for Denver to serve as a transportation crossroads and ensured the city would not wither into a ghost town. Decades later, other Denver leaders embraced the City Beautiful movement, called on citizens to “Imagine a Great City” and partnered with neighboring metropolitan administrations to advance the economic, environmental and cultural interests of the entire region. For readers not versed in the city’s post-World War II history, “Metropolitan Denver” explains how Denver became home to the largest concentration of federal agencies outside of Washington, D.C. By inviting these well-paying jobs to Denver, the city was able to build an economic base largely free of heavy industry. That, Goetz says, helped it avoid the problems facing Rust Belt cities when so much manufacturing was transferred overseas. Years later, when the city hitched its fortunes to the oil-and-gas industry, it learned the hard way about the benefits of diversifying its economy. Goetz and Boschmann also look at Denver’s historic and emerging challenges related to land use, air quality and transportation, as well as changing demographics, urban revitalization and gentrification. As an added bonus, the book explores the city’s changing sense of self and looks at how its efforts at placemaking have evolved, with the “Queen City of the Plains” moniker ceding elevation to the Mile High City. Where is Denver headed next? Goetz and Boschmann won’t speculate — “what [we] don’t know,” the latter says, “is how to read the tea leaves in any way” — but they both express optimism about the city’s chances for maintaining its high quality of life.